Congressional Republicans’ unhappiness with their party’s performance has been evident for months. Most recently, just 12 percent of House Republicans voted for a bill to raise the debt ceiling, whose scheduled vote resulted in at least one Tea Party group calling for Speaker John Boehner’s removal. The percentage of Republicans and leaners who rate the party’s performance positively has fallen 12 points since the GOP took control of the House in November 2010, according to a Pew Research survey last month. Over the past decade, the only time Republicans have been more negative about their party was in April 2009 — in the wake of Barack Obama’s election victory — when 21% rated the job it was doing as excellent or good. Democrats, on the other hand, have become more likely to say their party is standing up for its traditional positions. Roughly half of Democrats and those who lean Democratic (49%) rated their party as doing an excellent or good job on things such as protecting minorities’ interests, representing working people and helping the poor and needy. This is up 11 points from August 2011, but about the same as November 2010. A caveat is in order when looking at Republicans’ and Democrats’ evaluations of their party’s performance on the “traditional job” measure. The old maxim “nothing succeeds like success” applies here: Partisans tend to be happier with their parties when they’re winning. In five of six surveys since Obama took office in 2009, more Democrats than Republicans have given their party positive ratings for standing up for traditional positions. During the Bush administration, Republicans were often happier than Democrats with their party’s performance. Still, Republicans were not particularly positive about their party’s support for traditional positions after its sweeping triumph in the 2010 elections, when the GOP won back the House. In the days following that election, more Democrats (48%) than Republicans (40%) expressed satisfaction with how well their party was standing up for its traditional positions. 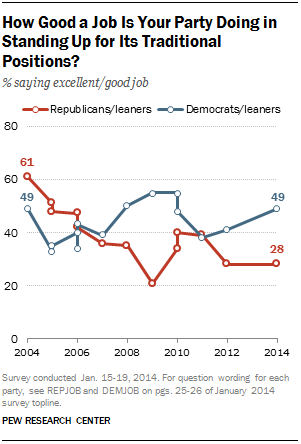 Since then, Republicans’ views of the party’s performance have only become more negative. Our January survey also included the parties’ ratings of the ideologies of the two parties. Overall, these views have changed little in recent years: 55% said the Republican Party was either very conservative (23%) or conservative (32%) while 51% viewed the Democratic Party as very liberal (27%) or liberal (24%). 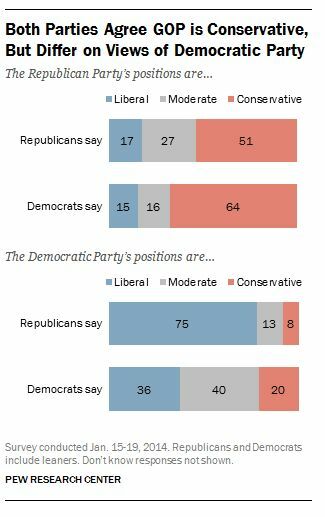 As in the past, Democrats and Republicans have somewhat similar views of the Republican Party’s ideology: 64% of Democrats and 51% of Republicans say the GOP is either very conservative or conservative. But Republicans are about twice as likely as Democrats to view the Democratic Party as very liberal or liberal (75% vs. 36%). Tea Party Republicans don’t see the GOP as especially conservative, and that is likely a factor in the low ratings they give the Republican Party for standing up for traditional positions. Just 44% of Republicans and Republican leaners who agree with the Tea Party say the GOP is very conservative or conservative; that compares with 55% of non-Tea Party Republicans. Only about a quarter of Tea Party Republicans give the party positive ratings for advocating traditional positions compared with 31% of non-Tea Party Republicans.